When my students feel good about themselves, they try harder. And when they try harder, they do even better. I really believe that math is all about confidence. Sure there is skill involved, but above all else kids do better when they believe that they can and will do well. Displaying student work is one way I have been able to increase student confidence. Even my seniors get excited about hanging their work on our "Fridge" (a green bulletin board with "The Fridge" at the top). It always surprises me that they'd rather hang their papers in our classroom than bring them home! The best part of hanging student work is what it does on bad days. On days my students don't feel like working hard or feel they can't do the work, I can point to their hard work as a reminder. We all need that reminder now and again. 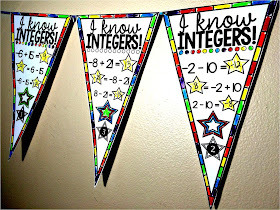 This is why I feel so strongly about math pennants. 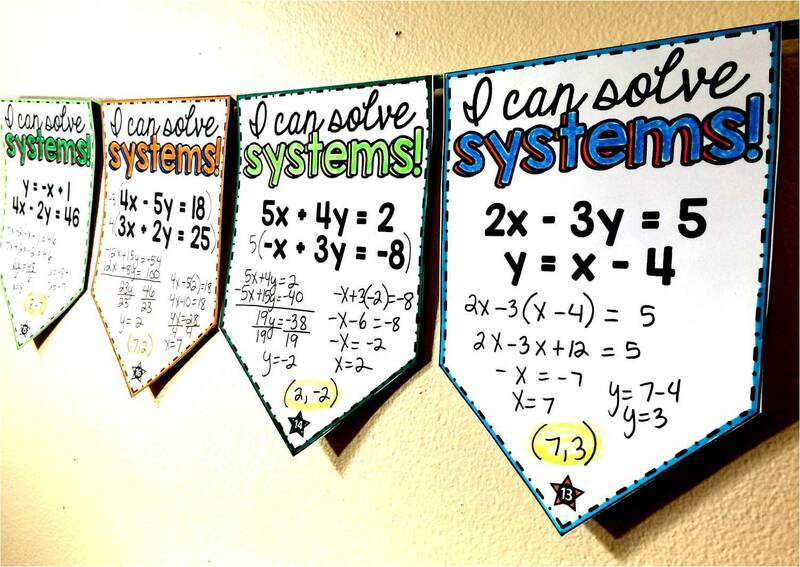 When students see their work hanging in their classroom, something special happens. 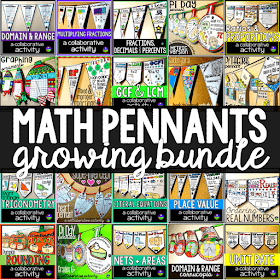 Math pennants also bring art into math, softening the math a little and making it more accessible for more students. 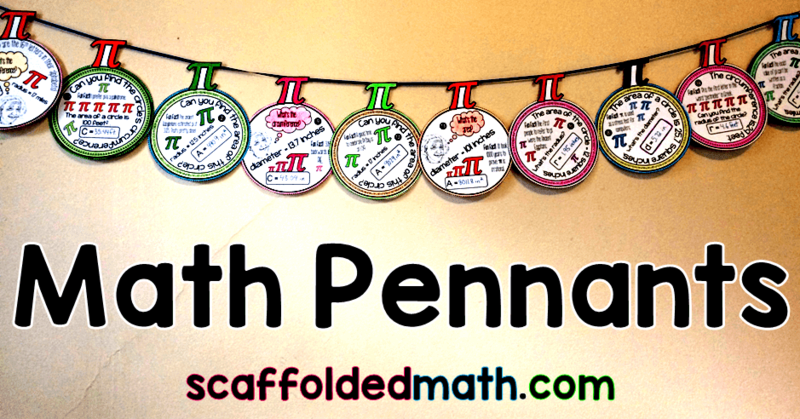 In this post I want to show just some of the many, many math pennants I have made over the years. Building this confidence starts from Day 1 of each school year. Once my students feel confident, they start taking more risks and real learning starts. Here is a Golden Spiral Back to School pennant to get kids excited for a year of math. 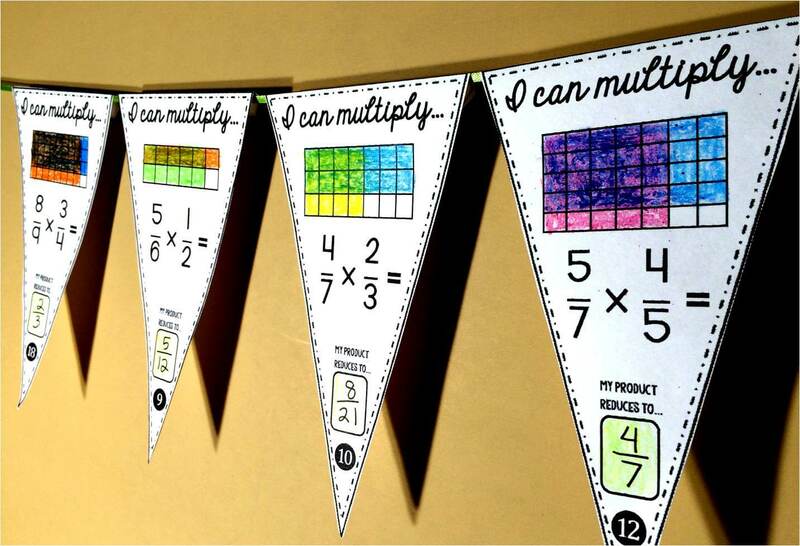 And an editable Math Boss pennant that gives students confidence looking forward to the year. Teachers have also told me that they helped gain student confidence on the days leading up to end of course and state exams. 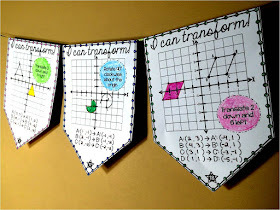 You can give math pennants a try by subscribing to my blog. 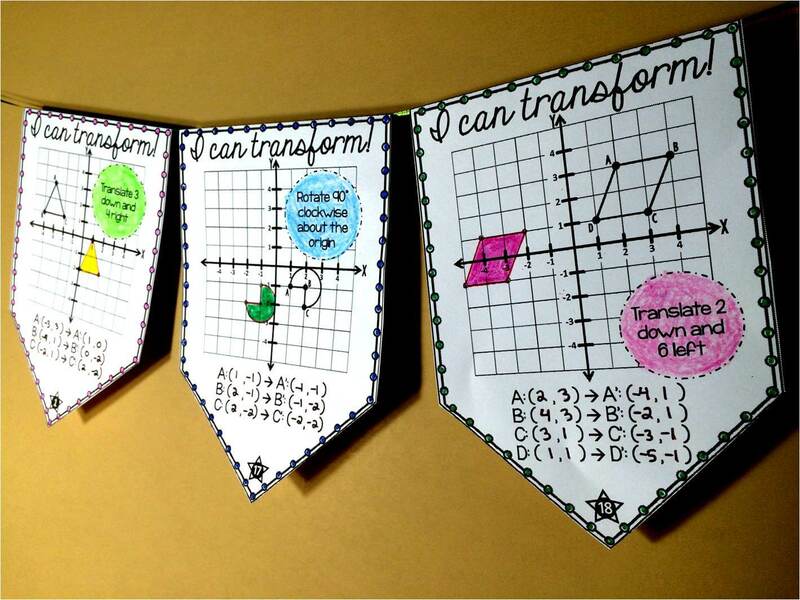 You'll get this 2-step equations pennant for free. 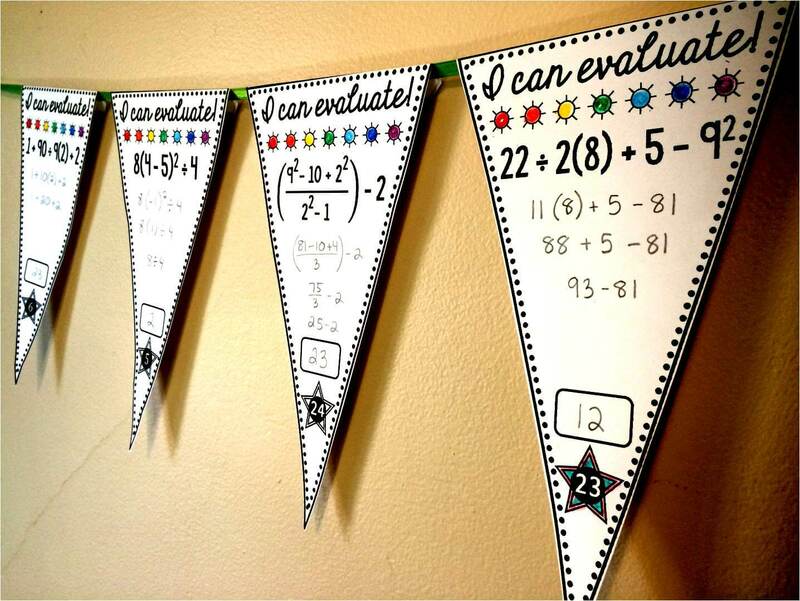 I've made so math pennants, many from teacher requests. Fractions! 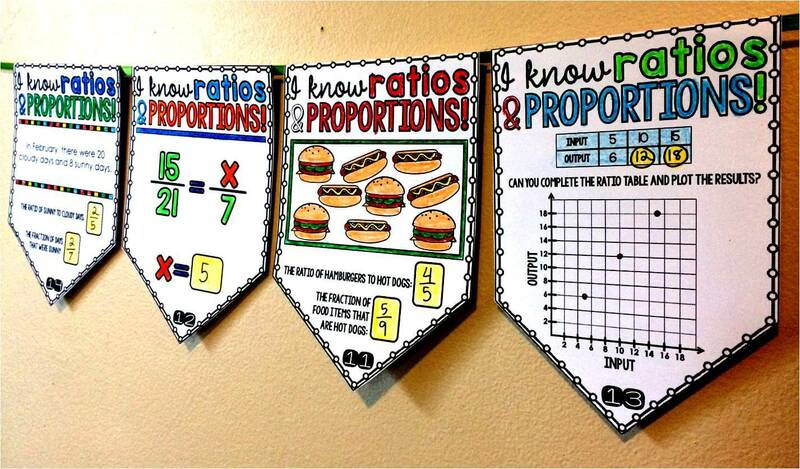 I have had a lot of requests for fractions pennants. 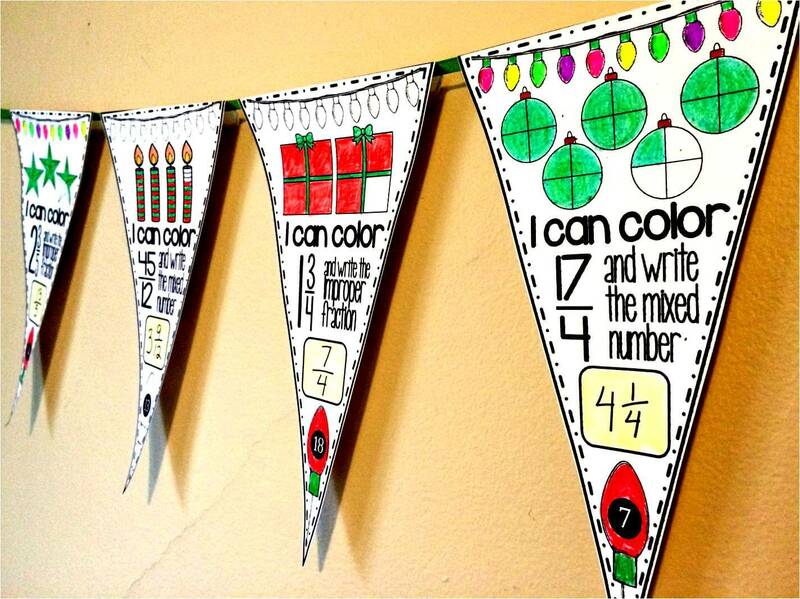 This fractions pennant bundle has pennants for the operations and for the holidays. This ordering Real numbers pennant came from a teacher request. 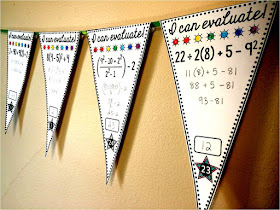 Above is another free pennant for order of operations. 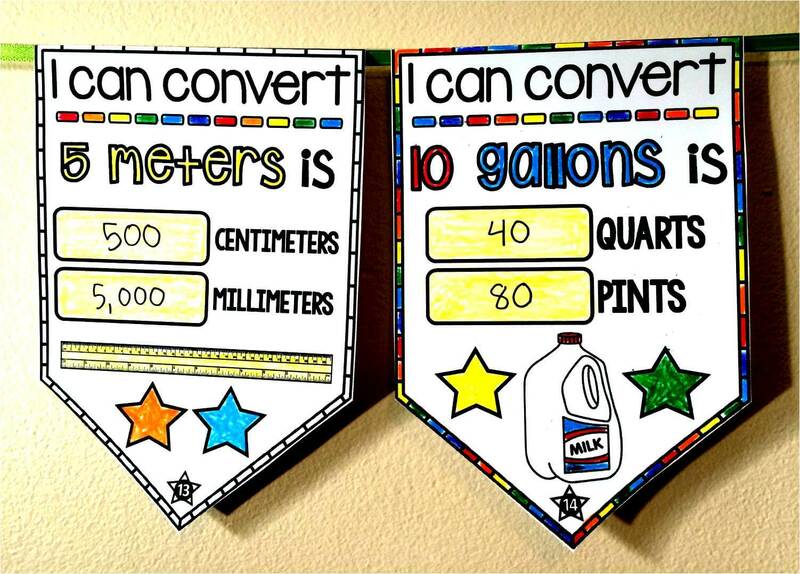 This conversions pennant came from another teacher request. 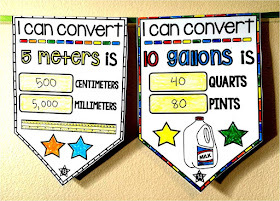 Students convert both metric and customary measurements. 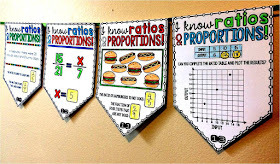 And this ratios and proportions pennant also came from a teacher request. 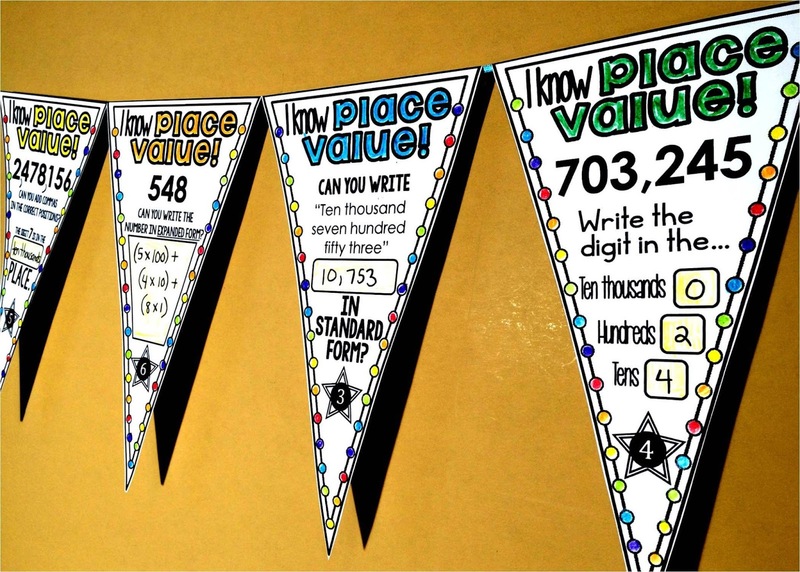 Here is a set of place value pennants. And a set for geometric transformations. 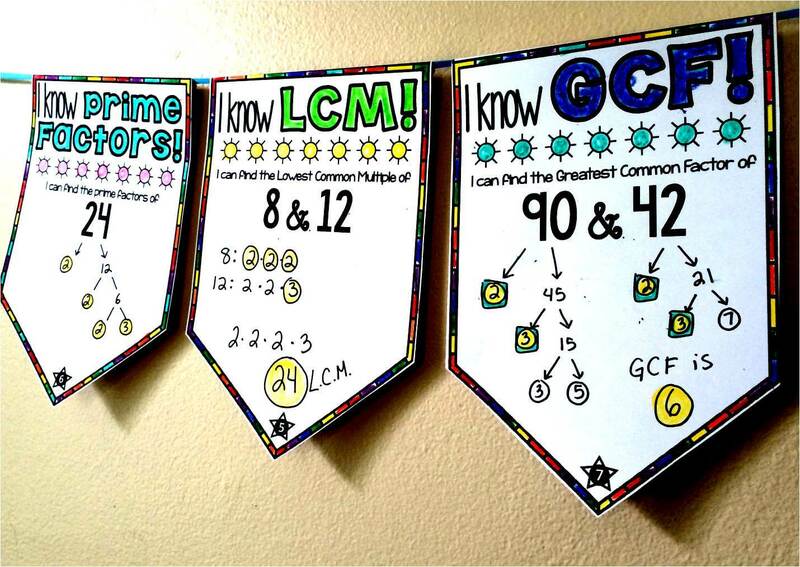 A teacher asked me to make her a pennant covering GCF and LCM. I hadn't remembered how tricky finding LCM was! This one was fun to make. 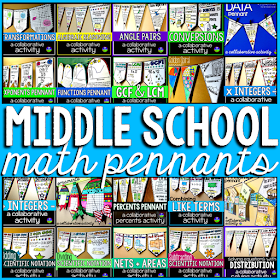 It's one of the pennants included in my Middle School Math Pennants bundle. Displaying student work becomes even more important in my classes because math disabilities can sometimes make these good grades very hard-earned. My favorite is when a student immediately gets up to hang a good grade without me asking. This is what it's all about. 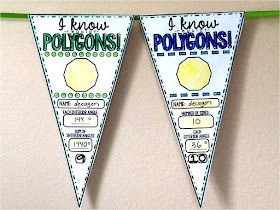 Here is a Pythagorean Theorem pennant. 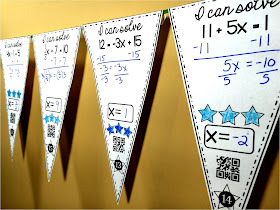 Students solve with elimination and substitution in this solving systems of equations pennant activity. The elimination questions require one, both or neither of the equations to be multiplied. 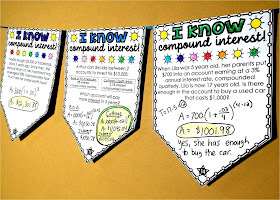 Pennants are a great way to celebrate holidays while not losing a day of Math. Some are specific to holidays. 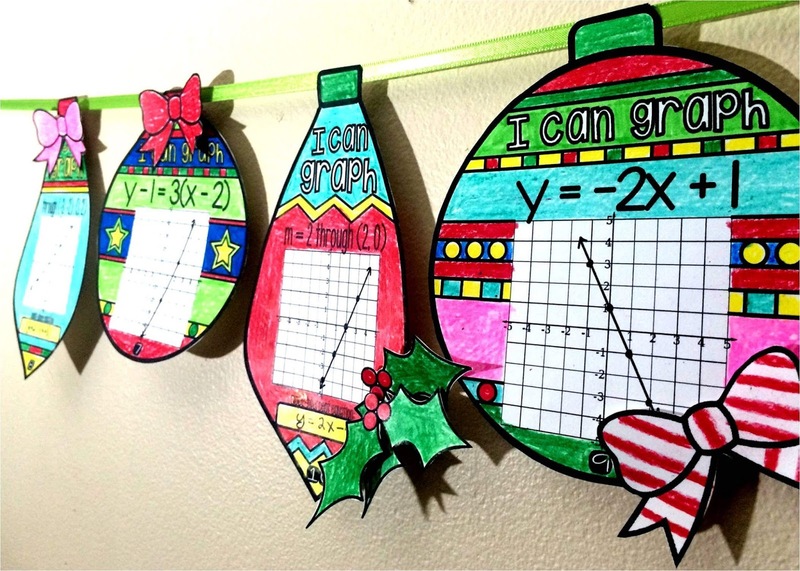 Here is a graphing linear equations ornament pennant to decorate for the holidays. Kids can also add optional bows and holly. 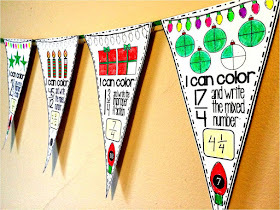 And here is a Christmas fractions pennant where students convert between improper fractions and mixed numbers and color to show the amount. 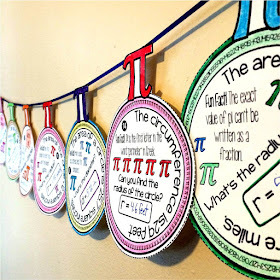 And of course every math teacher's favorite holiday-- Pi Day! 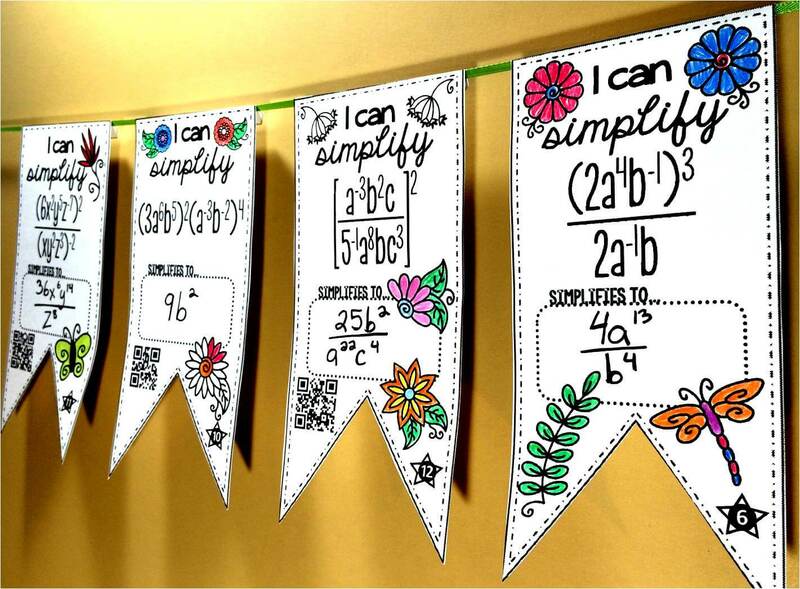 I used a super cool set of flower clipart for this exponents pennant. 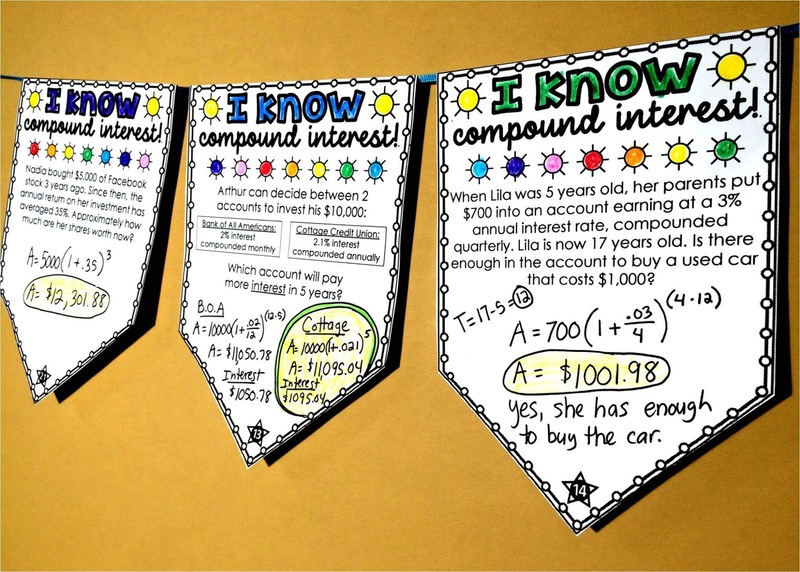 Teaching financial literacy is super important to me so I added in some credit card default and student loan defer questions to this set of compound interest pennants. Integers are so tricky, even for older students! 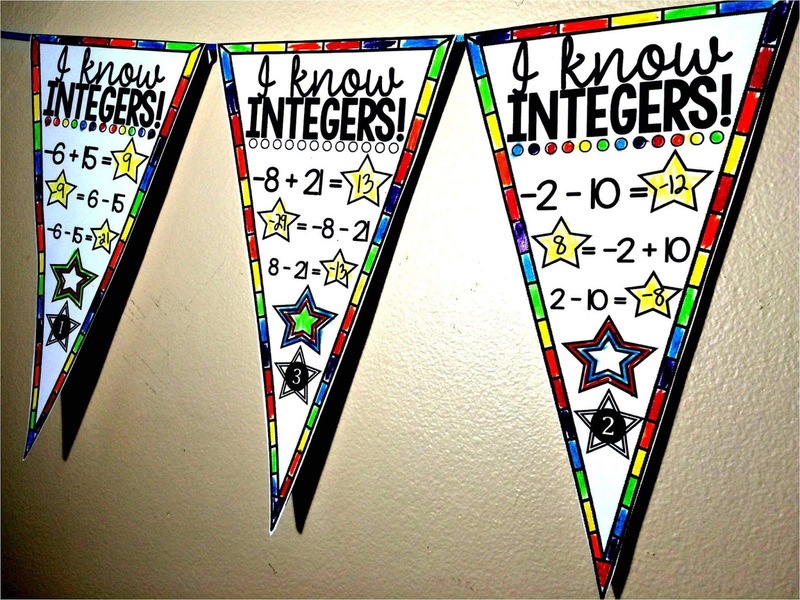 There are 3 problems on each integers pennant so that students can practice seeing the relationship between positive and negative numbers. 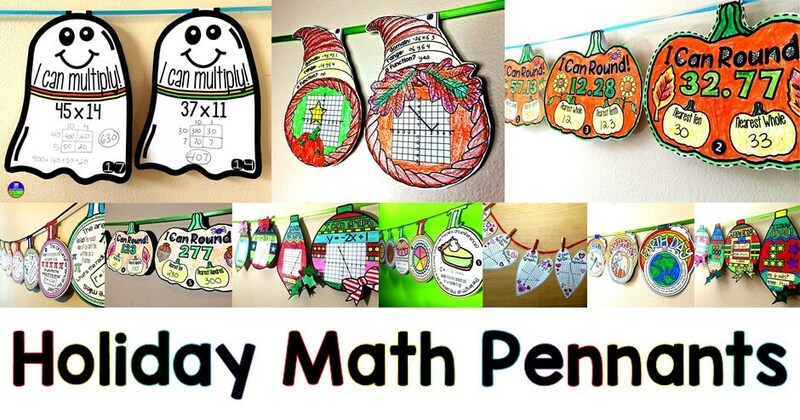 My friend Mandy from The Math Dyal sent over this great photo. 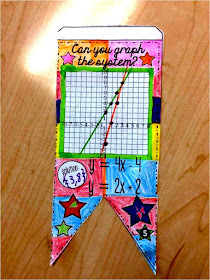 A student of hers who hardly does work created this systems of equations masterpiece. It made me so incredibly happy to hear the story behind it because reaching the most disengaged students is my goal with every activity. My students worked really hard during our domain and range unit this year. 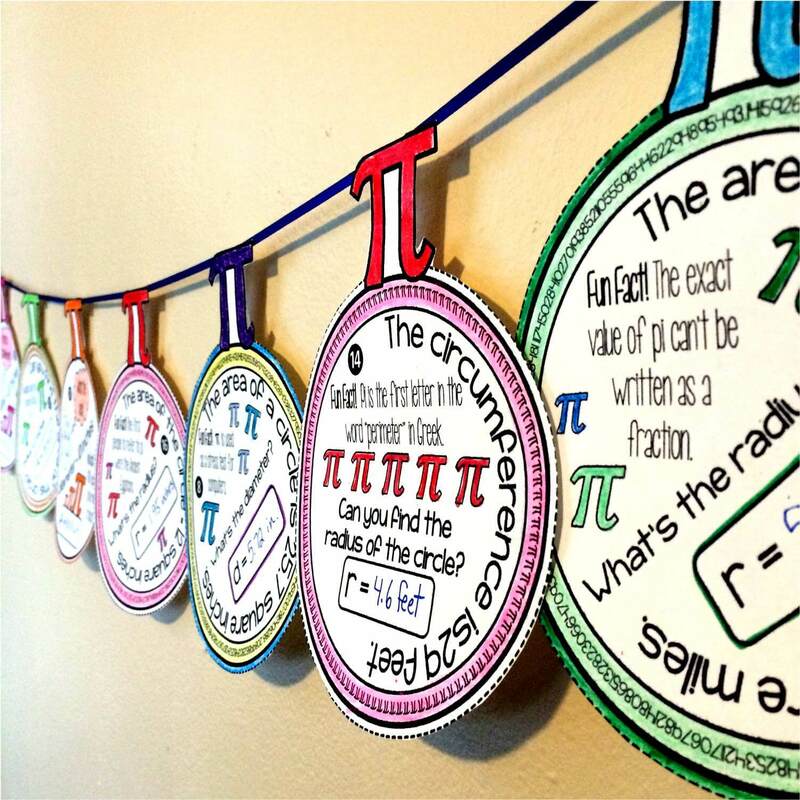 What better way to show off their hard work that with some fun Algebraic classroom decor? And what 6th grader wouldn't LOVE a chance to color? 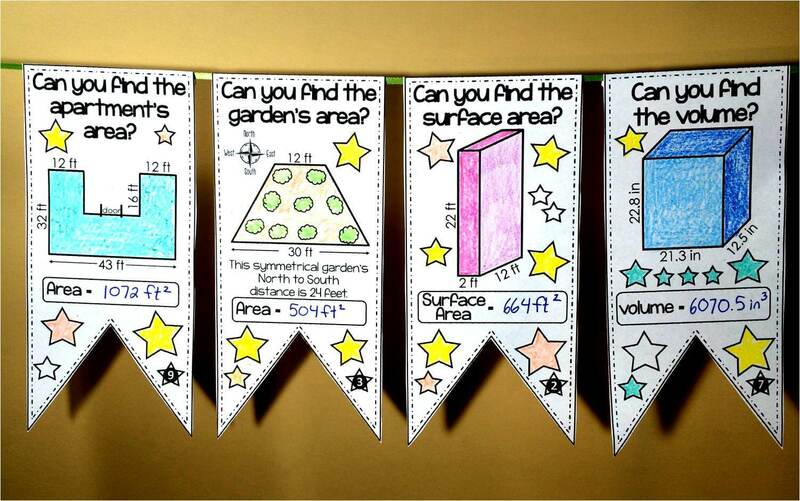 In this pennant, students practice finding volumes and surface areas, as well as areas of irregular shapes (gardens and apartments). 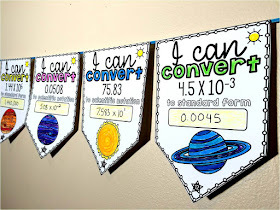 This pennant came from a teacher request for one to help her students convert scientific notation. I also made more sets for adding, subtracting, multiplying and dividing in scientific notation. And this "My Advice to Next Year's Students" pennant gives your current students the opportunity to give advice to next year's students. 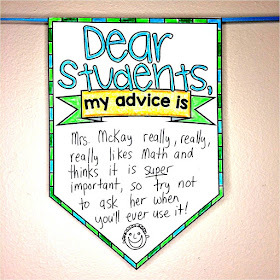 What have they learned over the year that would be helpful for next years kiddos as they first walk into your room? 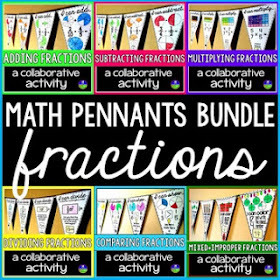 All of my math pennants can be purchased individually and at a discount in these math pennant bundles for elementary math, middle school math, Algebra, Geometry. There are also smaller content-specific bundles through that link. 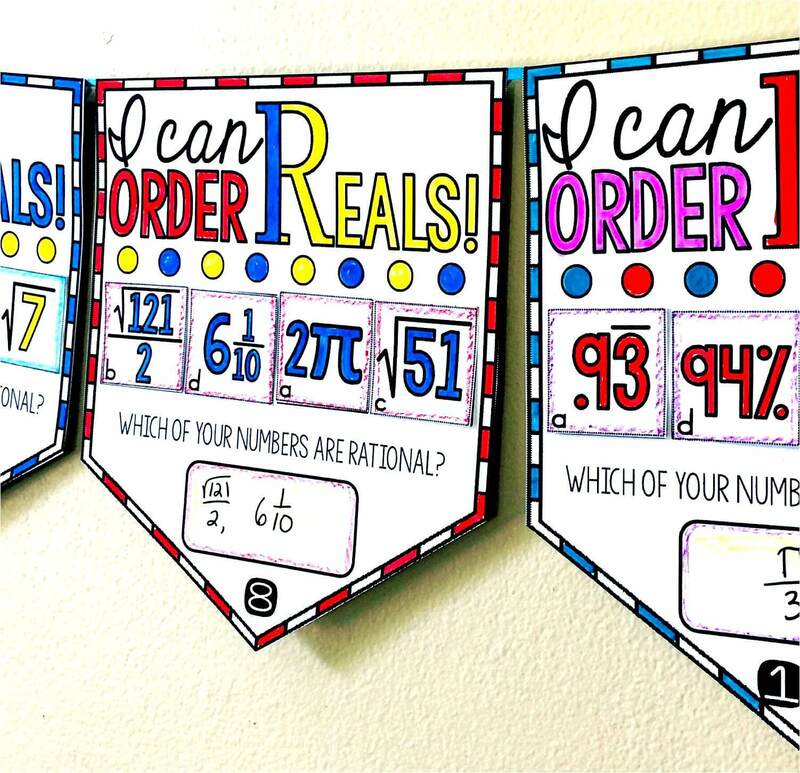 I would love to order this, but some of the math concepts are too high for my students. 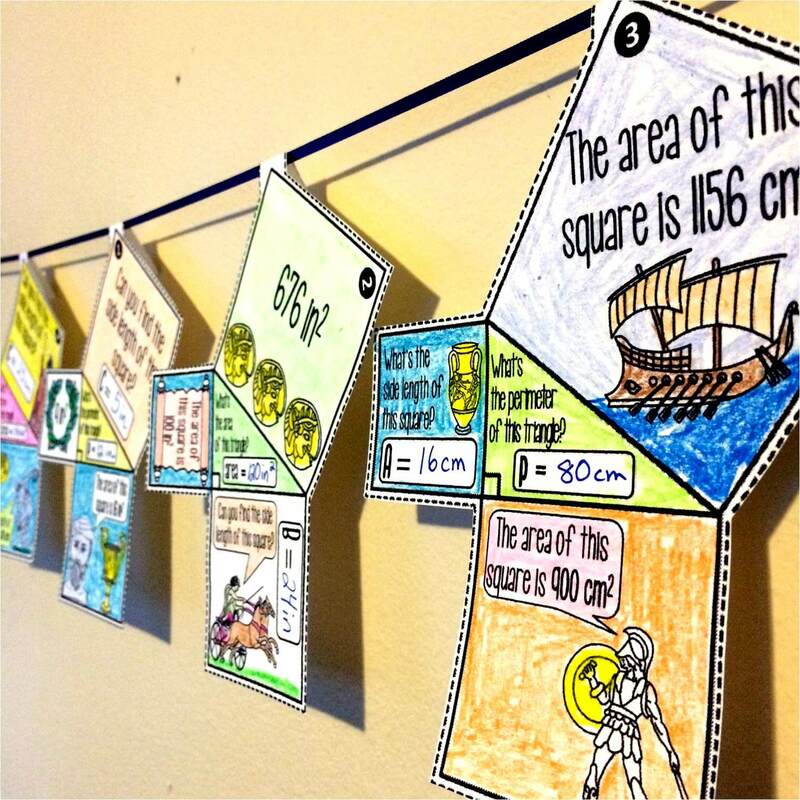 Do you have something for easier concepts, with differentiated lessons? I'll be creating more for additional topics but I've been sticking mainly with Algebra topics that are familiar. 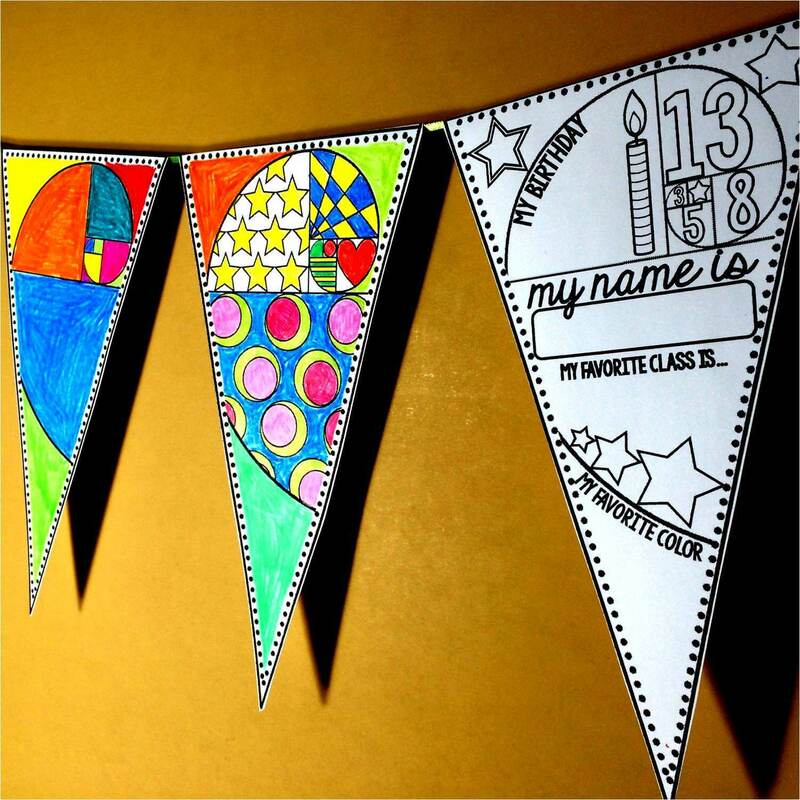 If you have a topic you'd like me to look into to make a pennant for I'm up for it! 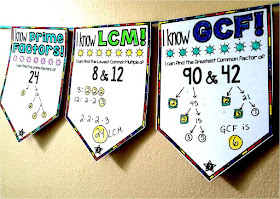 Since most school are requiring common core standards to be on all things we do, I think having pennants that correlate with each standard would be great. I think making them grade specific especially for the younger grades would be extremely helpful. 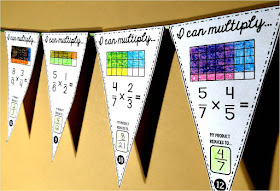 As a third grade teacher, I'd love to see some that focused on repeated addition as a method for multiplication introduction, place value through the thousands, introducing types of angles and lines, reading various types of graphs (bar graph, line plot, etc). These pennants are awesome. Katie, I have a question about repeated addition. 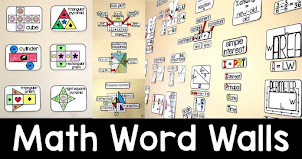 Would you be able to email me at scaffoldedmath@gmail.com? YES! I would love to see this too!! If you do/did this one please let me know. That would be amazing! I can provide you with pics of the kids work after they are completed through the year :). Thank you! Wow! These are gorgeous! 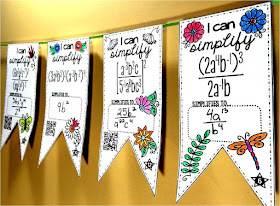 I would love to be in a math classroom decorated with these! 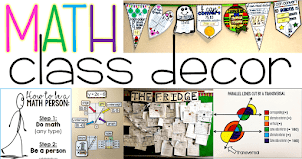 All my high school math classrooms had the occasional poster and not much else... 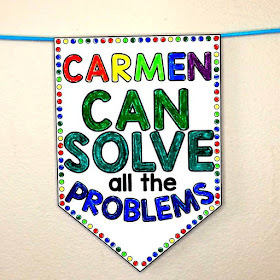 Thanks for linking up with Spark Creativity, this is an awesome example of creative pedagogy to share with our community! Thank you for allowing me to link up! I appreciate your kind words! Thank you! WOW!!!!!!! These are great! I homeschool my younger son with special needs and great interest in Math. So I am always looking for great ideas to make our learning time brighter. 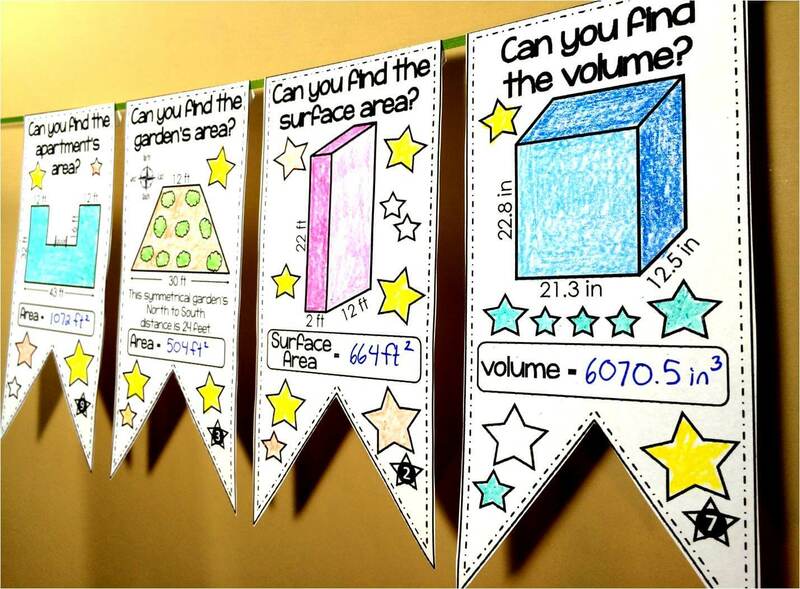 We keep a bulletin board with reminders of Math concepts. 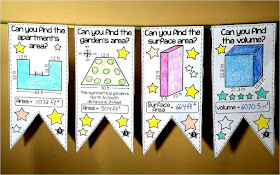 From now on we can make it in form of pennants. 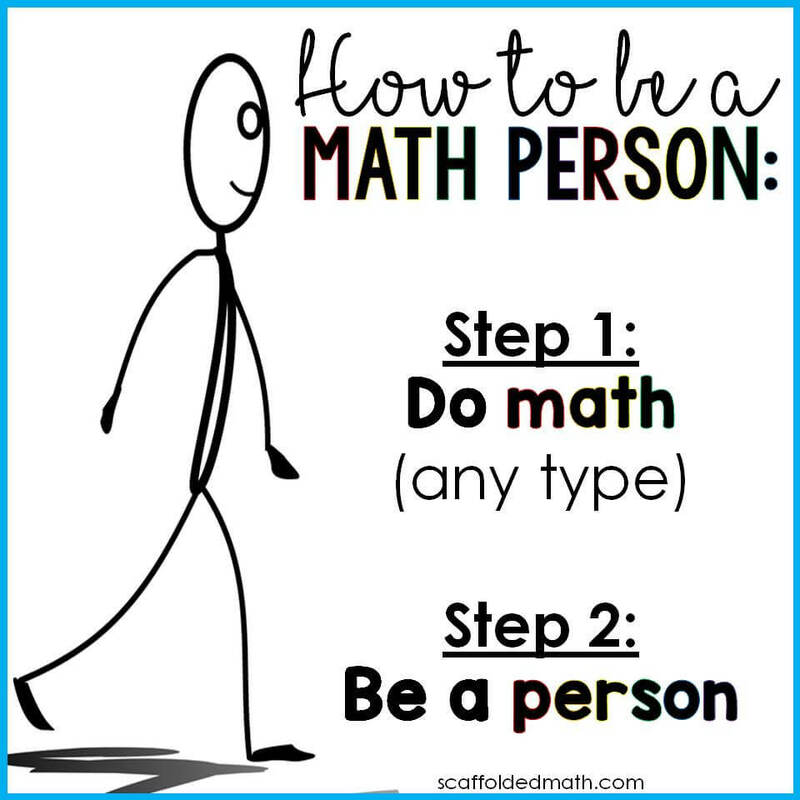 I specially love the Pythagorean one. 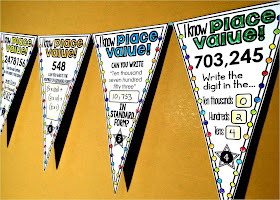 Do you have a volume, capacity, and mass pennants? Thank you so much! 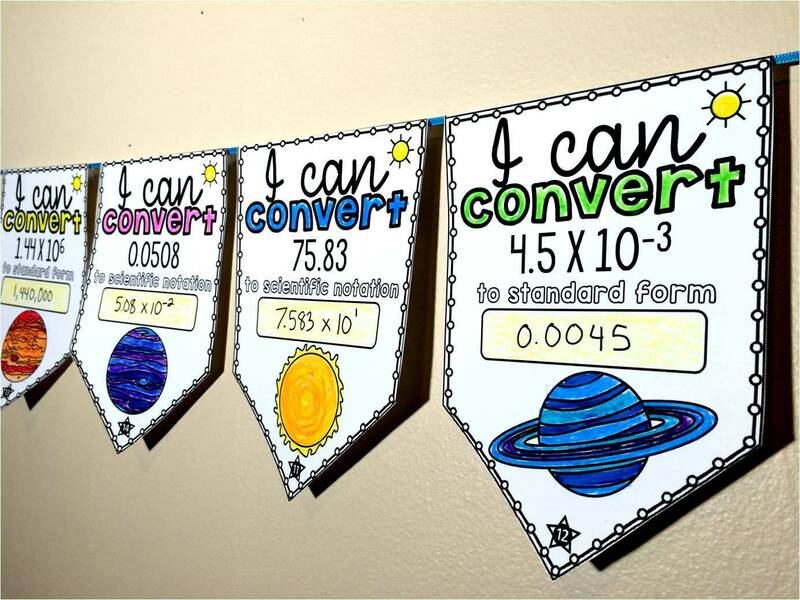 So I was a little ambitious thinking I'd be able to make science pennants as well, but a friend of mine has been making them. I can send you her contact info if you send me an email. I'm at scaffoldedmath@gmail.com. Is there a blank editable pennant? 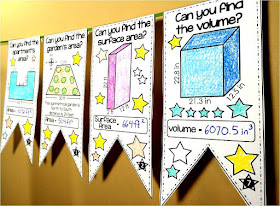 I would like to add each standard that I teach and add to my wall? On the Algebra factoring penenat, what is the QR Code for?